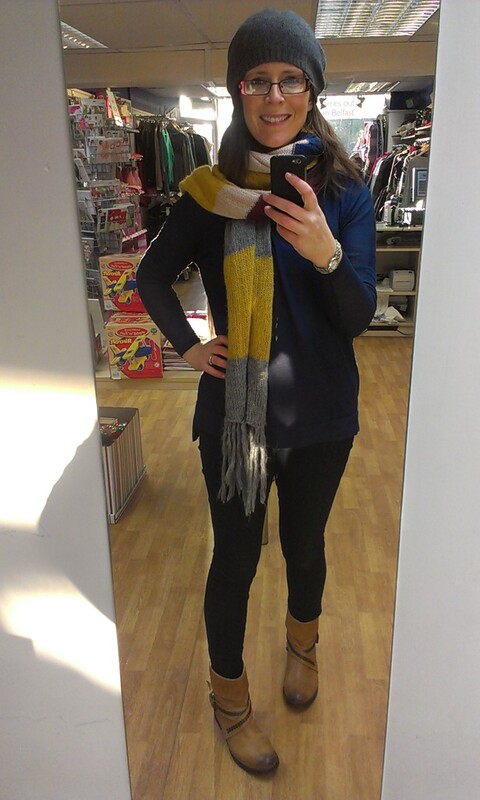 In a further attempt to be warm yet stylish, I dug out my grey beanie hat to wear in the charity shop today. So cosy…I didn't want to take it off all day! Having a big head, I tend to avoid hats (or it's more the case, they never fit me) but this cashmere mix one from M&S was a great investment. I wore it today with my Matalan stripy scarf (which Joanna over at Poppy's Style called her Dr Who scarf!). It's a fab one - last worn here - as it's so long and can be wound a few different ways to show off the colours. Also wore a Primark blush coloured long sleeved top with a Dorothy Perkins navy sheer top over (last worn here). Gok's Perfect Skinny jeans and the French Connection flat tan ankle boots (seen here) finished the outfit off. The other exciting news is that today sees my writing debut for Britmums, Britains biggest parent blogging network. Starting this month, I'll be editing the Britmums Style Blog Round-up, sharing a selection of the best fashion blog posts. Check out my first piece all about January sales on this link - next one will be published in mid-February. You look very cute wearing that beanie Avril:) Congrats on the writing front also! Congrats on the writing gig, that's great news. Love the beanie and scarf combo. Very cute! I'll post what I can to the FB page each week so do let me know if anything catches you eye. Avril x PS I sold the boots the next day….eek! I wasn't wearing them and I've two other pairs of tan boots. One of the Avenue 57 girls offered to buy them and they're away and the money's in the London fund! Really like that scarf, but I think I like every one of your scarves Avril! I'm glad my hair is long enough now to wear a hat, as a hat without hair peeking out the bottom can look a bit weird. Going by the weather forecast we'll be needing a hat or two over the next few days. Oh and congrats once again on the Britmums gig! I love this relaxed look and I particurly like the beanie. I don't really suit them so I have to go for the big furry trapper thing instead - now that is toasty. Well done on the writing job for Britmums. You'll be great! Meant to message you yesterday re Britmums Avril - congrats that's brilliant!